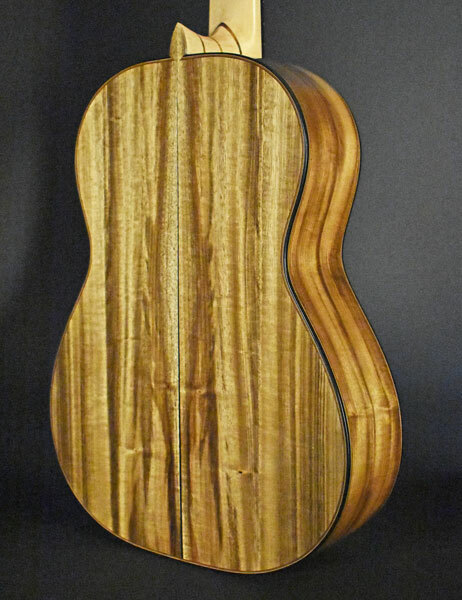 Portland composer and guitarist Bryan Johanson came to me this past summer with a challenge: “Can you make a guitar weighing less than 3 pounds?” I told him I could, but it would rule out the use of dense Rosewoods. “Is there anything that you have been wanting to try?” he asked. Since one interest I have is to make more guitars out of local and sustainable materials, I showed him some woods that included Oregon myrtle, Port Orford cedar and Pacific yew. 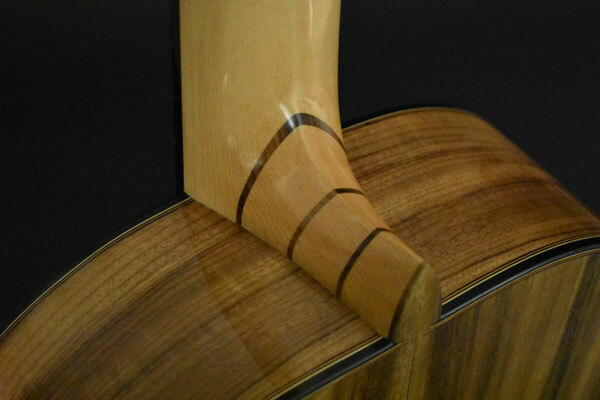 I also had an environmentally friendly fretboard made by Rocklite™ that mimics the nicest ebony you have ever seen. Bryan liked the concept and dubbed it the “Oregon Terroir Guitar”, borrowing a vintner’s term for the local environmental conditions that influence the character and taste of a wine. 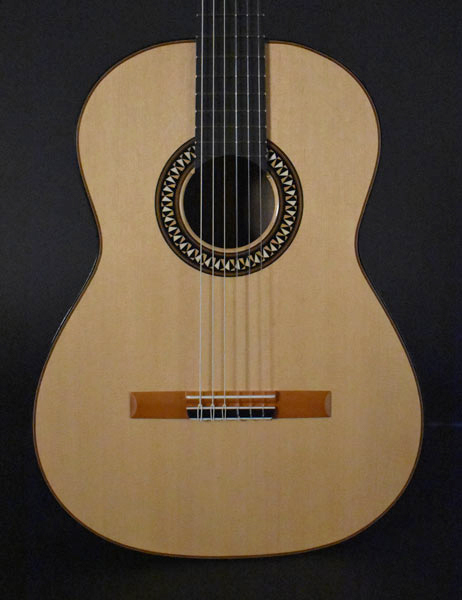 In the end, we made the following choices; Port Orford cedar top and neck, Oregon myrtle back and sides, Pacific yew bridge, headstock veneer and end graft detail, and Rocklite™ fingerboard and binding. To avoid adding another untested variable into the mix, we elected to stay with a closed bar Hauser bracing pattern. I braced the back with some ultra-light, but stiff Sitka spruce from the 1940’s. 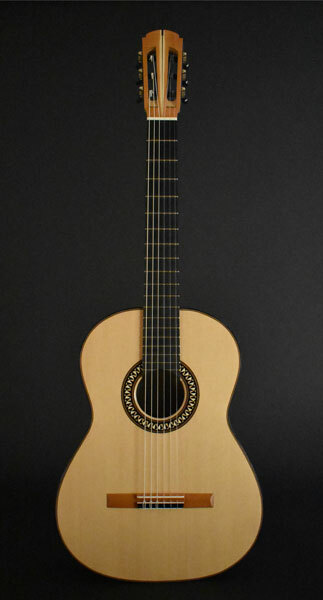 The Sitka was also used for top harmonic bars, fingerboard, soundhole and bridge patches while Engelmann spruce was used for the fan bracing. The rosette was made of Castillo, American holly and African ebony (evidence that I did cheat in a few areas). I designed a custom engraving referencing the rosette pattern which was executed by Rob Rodgers of Rodgers Tuning Machines. The final weight? 2 pounds 15 ounces. A further reduction in weight (approximately 3 ounces) could have been realized had we used Spanish cedar for the neck, but we both decided we should utilize a local wood for the neck blank.